Nakoosh is known as being the most distinguished and well reputed clothing brand in Pakistan. This brand has been serving the fashion industry with the women clothing for the last 15 years. The best quality of this brand has been in the emergence of finest and superior quality clothing fabric that has always grabbed the attention of the women. They just love to play with the fabric and this is the main reason that in every single collection the women will certainly notice some fresh fabric such as silk, cotton, chiffon, georgette, voile, Swiss and velvet. 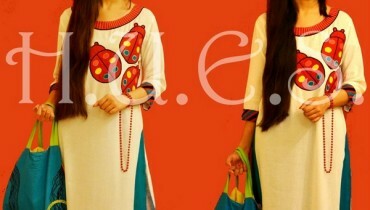 In addition, there is always one thing common in their clothes and that is the embroidery work. Newly, Nakoosh highlighted the hottest and most modern formal wear collection 2012-2013 for women. The collection has not just designed in trendy and stylish mode but even give away the feel of being elegant and versatile as well. The entire formal wear collection 2012-2013 has been covered with the emergence of long shirts, long frocks, A-line dresses, straight shirts and panel suits. All the long shirts have been even accessible with the style textural work of open and round shirts with the embellishment of Angrakha designs on them. In this article we are pasting few pictures for the fans of Nakoosh formal wear collection 2012-2013 for women. In addition, you will love the collection by witnessing all the colors in every single dress such as red, maroon, brown, orange, grey, beige, rust, purple, pink, dark grey, yellow, dusty green and black. The embroidery working on the formal dresses have been decorated with the laces and zari work. In simple words, the whole formal wear collection by Nakoosh has been much alluring and eye catching attractive for the women. So all the women if you have never try the Nakoosh dresses then just try their formal wear collection 2012-2013 now and we are sure that you will fall affectionate for the dresses.